They are more inspired as North Korean leader Kim Jong-un was on Monday reported to have visited the renovated and expanded Taesong Department Store in Pyongyang, which is seen as a positive sign for the country to further develop its economy. 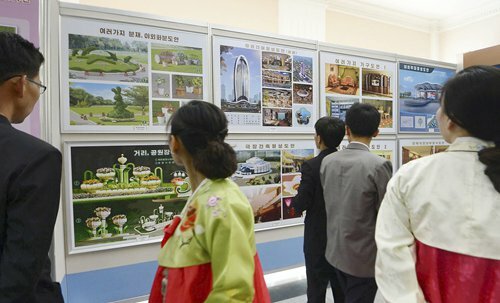 According to nkews.com, Kim said the new "modern department store" would provide Pyongyang residents with "fine quality" goods including groceries, clothing, shoes, housewares and stationery. He was also reported to have said that the shop will "sufficiently produce and sell quality daily necessities and mass consumer goods for the convenience of the people," the report said. Lü Chao, a research fellow at the Liaoning Academy of Social Sciences, told the Global Times on Monday that the move could inspire many Chinese companies, since it could be seen as a sign of North Korea's willingness to import more daily necessities as it strives to improve its residents' living standards. Li Guang, foreign trade manager of Hot Tex Woolen Co, a fabric supplier in East China's Jiangsu Province, told the Global Times on Monday that North Korea has huge demand for textiles, and the move is a positive signal for companies like his that always want to ship more products to the country. "But since uncertainties remain, our export volumes are limited," Li said. Li's company exported fabrics worth $20,000 to North Korea last year. Li said he's also planning to attend the Pyongyang International Trade Fair to assess the situation and look for more opportunities in the country. North Korea offers "an ocean of opportunities," said Li. Apart from export opportunities, Chinese investors have also shown increasing interest in the market by taking trips to North Korea to get "a full understanding of the investment environment of the country," an insider told the Global Times on Monday. The insider noted that most investors still have a "wait-and-see attitude" since UN sanctions have not been lifted yet, but "they expressed willingness to invest in the country." The willingness is also bilateral. "Local authorities in North Korea also provided foreign investors with much convenience and they particularly welcome Chinese investors," the insider said. "There are many sectors where Chinese investors could invest, such as electricity and transportation," said Lü, adding that bilateral trade will also gradually increase as tensions on the peninsula ease. "Until then, China will continue to adhere to the UN sections, as it does now," Lü added.